As a full production Winery, our Paso Robles Tasting Room is a great stop to make on your next Central Coast Wine Country excursion. Give us a call before you visit and we will be more than happy to accommodate any size group. If tasting great wine is what motivates you, drop by and try our wines, discover what we are all about, and take home some of the best wine on the Central Coast! We hope to see you soon. Please contact us if you have any questions - we're here to help! 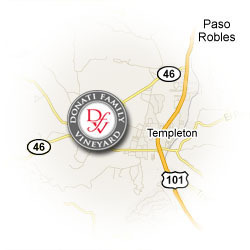 Can't make it to our brick and mortar Paso Robles Vineyard location, but still want to try our wine? No problem! We offer our wines for sale online. You can browse our selection here! Please call or fill out our appointment request form to make an appointment ahead of your visit.